Haq's Musings: Will Economic Mess Get Worse Under President Zardari? Will Economic Mess Get Worse Under President Zardari? Two recent decisions by Mr. Zardari showed a disregard for Pakistan’s alarming deficits, they (sources) said, speaking anonymously because they did not want to publicly criticize the next president. 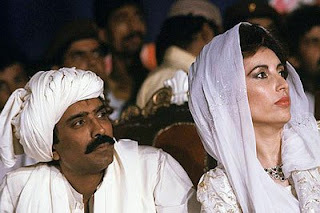 In April, Mr. Zardari told Ishaq Dar, the finance minister at the time and a member of Mr. Sharif’s party, which has since broken with Mr. Zardari, that he wanted the price the government paid farmers for wheat to be raised substantially as a way of rewarding an important constituency in Punjab Province, the nation’s most populous, according to two participants in the discussion with Mr. Zardari. The government would then have to heavily subsidize the cost of wheat to the consumer. When Mr. Dar asked Mr. Zardari how he thought the government would pay for the subsidy, Mr. Zardari replied, “Print the notes,” according to the two participants, a government official and an associate of Mr. Zardari’s. In an effort to solve the impasse over the subsidy, it was suggested that Mr. Zardari form a committee of experts. “ ‘I am the expert,’ ” Mr. Zardari said, according to his associate. Farahnaz Ispahani, a spokeswoman for Mr. Zardari’s party, denied the account. The two officials described another episode in May as the budget was being prepared. Mr. Zardari decided to scrap a proposed capital gains tax after a visit from a group of influential stockbrokers from the Karachi stock exchange, they said. The revenue from the capital gains tax, and from an income tax proposal on the rich, would have paid for an income support program for the poorest Pakistanis, they said. More than half of Pakistanis live on less than $2 a day, according to the World Bank. In Mr. Zardari’s defense, the finance minister, Naveed Qamar, said that political stability would be restored to Pakistan once Mr. Zardari was president, and that the unsettled economy would benefit from the new political order. Indeed, Mr. Zardari, who is expected to be chosen in Saturday’s election by the Parliament and four provisional assemblies, is the unintended beneficiary of sweeping powers accumulated by President Musharraf, including the right to dismiss the army chief of staff and dissolve Parliament. Given Mr. Zardari's past record of economic mismanagement as privatization minister in his wife's cabinet, the hopes in his stewardship of Pakitan's economy have not been great. While some measure of political stability will return to Pakistan with President Zardari in office, these latest disclosures are not going to help restore consumer, business and investor confidence in Pakistan, an essential requirement for its economy to start growing again. Farahnaz Ispahani, a spokeswoman for Mr. Zardari’s party, denied the account." Zardari will bankrupt the country and others will keep denying. I can only assume later Zardari will take the insanity plea. Scary. Fasten your seat-belts. Severe turbulence expected ahead. There is a rumor in the stock market (I work for the market) that the Capital Gain tax issue was settled in Rs. 4 bn. With Zardari at the helm, I agree that Pakistanis are in for a rough ride. I just hope it's not too rough and they can survive it to live for another day.